This name uses Spanish naming customs: the first or paternal family name is Amenábar and the second or maternal family name is Cantos. Amenábar is the son of a Chilean man, Hugo Ricardo Amenabar and a Spanish woman, Josefina Cantos. He has a dual Chilean-Spanish citizenship. His father worked as a technician at General Electric, while his mother decided to stay at home and take care of the children. Alejandro is the younger of two brothers; his older brother, Ricardo, was born December 4, 1969. Josefina's older sister had moved to the capital of Chile, Santiago, and she invited Josefina to join her there. In Santiago, Josefina met Hugo. Alejandro was born on March 31, 1972. In August 1973, his family moved to Spain. The family settled in Madrid, living in a camping caravan. When Alejandro was six years old, they moved to a complex on the outskirts of the town of Paracuellos de Jarama (Madrid). Alejandro and his brother did not watch much television. From the age of 15, Alejandro would dedicate his time to going to the cinema to watch movies. Other than theater, his passions were writing stories and reading books. According to Alejandro’s mother, Alejandro had the capacity to absorb everything he read. As a child, he also composed melodies with the keyboard and guitar with the same ease as when he wrote his stories. Alejandro started his studies at the Padres Escolapios de Getafe school. In his second year of high school, he transferred to the Alameda de Osuna institute, in the north-east of Madrid. The school was not close to where Alejandro was living; however, his parents, who were very concerned about his education, decided to enroll him in that institute because it was known as one of the best schools in Madrid. Before he became a director, Alejandro worked as a stock boy in a warehouse and as a gardener, until he had enough money to buy his own home camera. He did not want to start his university studies in cinema before ever having touched a camera. Amenábar entered the Information Sciences Faculty at Madrid's Complutense University, where after numerous scholastic failures he decided to give up studying cinema and he began directing. The advantage from having attended university was that he met people who later in life would become very important throughout his career (that was the case for Sergio Rozas and Carlos Montero, through whom he met Eduardo Noriega). At university, he also met Mateo Gil, a friend and companion, and the pair made a pact to always support each other's projects. Between 1991 and 1994, Amenábar made three short films which in a very significant way influenced his first full-length films: La Cabeza, Himenóptero, and Luna. Knowing José Luis Cuerda helped Alejandro greatly in his career. A friend of José Luis Cuerda gave him the script of Himenóptero so he would give his opinion. Thereafter, Cuerda was interested in Amenábar’s work. This led to him becoming the producer of Thesis (1996), which is one of Amenábar’s most recognized films, putting his name on the map. Thesis was a thriller set in the School of Information Sciences at the Complutense University of Madrid. 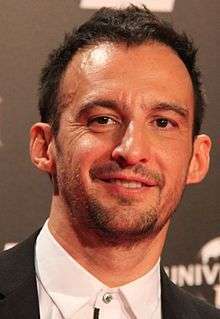 Through this film, he gained the attention of critics in the Berlin Film Festival and won seven Goyas, including Best Picture and Best New Director. In 1997 he made Abre Los Ojos, a science fiction movie that had notable success at international festivals such as Berlin and Tokyo. Impressed by the movie, Tom Cruise bought the rights to adapt and produce the film, starring in a remake, Vanilla Sky. His third large film was The Others, a ghost story starring Nicole Kidman. It was very successful at an international level, especially in Spain, where it was the most viewed film that year. The Others was also very popular in the United States, where it was at the top of the box office for several weeks. The film premiered at the Venice Film Festival in 2001, won eight Goyas, including the Best Picture and Best Director, and was nominated for best European Film Movie. In 2004 Amenábar released The Sea Inside, a real life-story about a quadriplegic Ramón Sampedro (played by Javier Bardem), which addressed issues such as euthanasia, abortion, or “the right to a dignified life.” The movie won 14 Goyas, including best movie and best director, and an Academy Award for Best Foreign Language Film in 2004. In 2008 Amenábar released his next film, called Mists of Time; however he later changed the name to Agora. The film starred big-name actors including Rachel Weisz and Max Minghella. Agora premiered on October 9, 2009, and with a budget of 50 million euros, it is the most expensive Spanish film in history. After a hiatus of almost seven years, Amenábar came back in 2015 with a new movie titled Regression, a thriller starring Ethan Hawke and Emma Watson. The film had its world premiere at the San Sebastián International Film Festival in September 2015. Initial reviews were lukewarm. Amenábar is also the composer of the soundtrack of his films, as well as others, such as Butterfly's Tongue directed by José Luis Cuerda and Nobody Knows Anybody directed by Mateo Gil. In 2004, Amenábar came out as gay. On 18 July 2015, he married David Blanco. ↑ Regression. Variety (2013-10-31). Retrieved on 2014-05-22. ↑ "Amenábar habla de su homosexualidad" (in Spanish). Espectáculos. 31 August 2004. Retrieved 9 July 2014. ↑ "Alejandro Amenábar se casa este sábado: todas las fotos de su romance" (in Spanish). Vanitatis. 18 July 2015. Retrieved 18 July 2015.